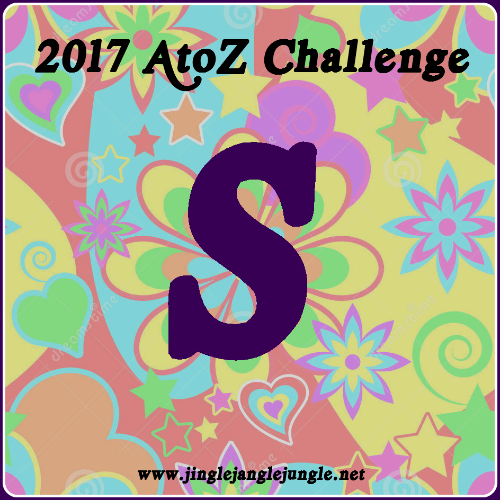 Today the #AtoZChallenge brings us to the letter S. These three songs were the top ‘S’ songs according to the Billboard Hot 100 Year-End lists. "Seasons in the Sun" is an English-language adaptation of the song "Le Moribond" by Belgian singer-songwriter Jacques Brel with lyrics by American singer-poet Rod McKuen. It became a worldwide hit in 1974 for Canadian singer Terry Jacks and became a Christmas Number 1 in 1999 for Westlife. Jacks's version is one of the fewer than forty all-time singles to have sold 10 million copies worldwide. The original French-language song is a sardonic ballad, in which the speaker gives backhanded farewells to his adulterous wife and her lover and the priest he disagreed with while sarcastically expressing his wish that there should be singing and dancing when he is buried. I know you will take care of my soul. ("eyes closed" refers to closing his eyes to her infidelity, following on from the preceding verse in which he bids goodbye to his wife's lover Antoine). Terry Jack’s version is ranked number 2 on the 1974 Billboard Hot 100 Year-End Charts. "Silly Love Songs" is a song written by Paul McCartney and performed by Wings. The song appears on the 1976 album Wings at the Speed of Sound. The song was written as a rebuttal to music critics, as well as former Beatle and friend, John Lennon, accusing Paul McCartney of writing lightweight love songs, also features disco overtones. The US single was released on 1 April 1976 and spent five non-consecutive weeks at number 1 on the Billboard Hot 100. "Silly Love Songs" was the number 1 pop song in Billboard's Year-End Charts of 1976. It was also the group's second of three number ones on the Easy Listening chart. The single was certified Gold by the Recording Industry Association of America for sales of over one million copies. Billboard listed "Silly Love Songs" as Paul McCartney's all-time biggest Hot 100 single. In 2008, the song was listed at No. 31 on Billboard's Greatest Songs of All Time, commemorating the 50th anniversary of the Billboard Hot 100 chart. The UK single was released on 30 April 1976 and reached number 2 on the UK Singles Chart. The song was McCartney's 27th number one as a songwriter, the all-time record for most number one hits by a songwriter. With this song, McCartney became the first person to have a year-end No. 1 song as a member of two distinct acts. He previously hit No. 1 in the year-end Billboard chart with "I Want to Hold Your Hand" in 1964 and "Hey Jude" in 1968. "Shadow Dancing" is a disco song performed by English singer-songwriter Andy Gibb that reached number one for seven weeks on the Billboard Hot 100 in 1978. Albhy Galuten arranged the song with Barry Gibb. While Andy Gibb would have three more Top 10 hits in the U.S., this would be his final chart-topping hit in America. The song became a platinum record. According to Billboard's Book Of Number One Hits, Andy Gibb became the first solo artist in the history of the U.S. pop charts to have his first three singles hit the number-one spot. It remained in the top spot for seven straight weeks from 17 June to 29 July 1978. On 5 August it was replaced by The Rolling Stones with their hit "Miss You." Additionally, "Shadow Dancing" was listed by Billboard as being the number one single of 1978. In addition the song peaked at number eleven on the soul chart and sold 2.5 million copies in the United States alone. Its two B-sides "Let It Be Me" appeared on US version and "Too Many Looks In Your Eyes" was from his previous album Flowing Rivers. In July that year, Gibb performed "Shadow Dancing" at the Jai-Alai Fronton Studios in Miami, when Barry, Robin and Maurice unexpectedly joined him on stage, and sang this song with him. It was the first time that all four brothers performed together in concert. Tomorrow brings us the letter 'T'. I loved 'Seasons in the Sun' and still have the original 45. Terry Jacks and his wife, Susan, were huge stars here in Canada. As for 'Silly Love Songs" I kind of agree with John Lennon. ☺ Andy Gibb rose to fame so quickly. Too bad it didn't last! His tragic death at age 30 was a such a shock. Another great write up, Mary! I remember learning Seasons in the Sun in music class while in elementary school. Now that I think back on it, we learned quite a few 'current hits' during that time. The odd thing I found about Seasons in the Sun was that most of the videos I found were restricted and not playable in Canada. I really had to dig deep. Thanks for your continued support during this challenge! I know Seasons in the Sun from Westlife, I'd never heard the original English Language version before, and I had no idea it was a translation :) Andy Gibb sounds a lot like his brothers. I didn't know it was a translation, either. For some reason, I thought it was an original for Terry Jacks. I learn so much from these posts. Thank you for sharing! I hope you are well, my dear. Happy Earth Day. Seasons in the Sun always gets me teary eyed, no matter which version I hear. Surprisingly, did not know Paul McCartney's song... its exactly the simple feel-good kind of song I would love usually. I'm willing to be that you would enjoy most of the Paul McCartney and Wings catalog. Lots of great songs there. Well now I'm just a little sad for you, McCarthy. Hold on to this post. Don't lose track of it, because unfortunately those Gibb brothers make no more appearances in this challenge. There will be a candlelight vigil tonight in hopes of a return. Please be careful and don't burn your house down with a photo remake of The Police's 'Wrapped Around Your Finger'. I am having a good time sharing these songs with you as well. Love reminiscing, great list! Lovely treasure! Well now, I can't please everyone now, can I? Thank goodness you liked at least one of these. Now I won't have to jump off that bridge. I especially remember hearing "Seasons in the Sun" a lot when it was on the charts. I think my youngest sister liked it and used to play it a lot.